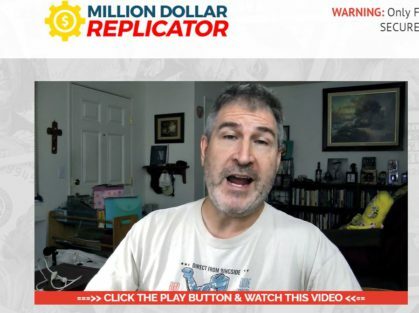 In this quick review of Million Dollar Replicator I’ll be going over everything you need to know about before getting out your wallet. Will you really be able to make 7 figures in 30 days? Is anything they say on the sales page even remotely true? Let’s dive in deep and find out! Is Million Dollar Replication Recommended? No! A few days ago a received an email from someone claiming that I could quickly and easily make money with a program called Million Dollar Replicator. After taking a few minutes to look it over, I just knew I had to take some extra time to dig deep into it and learn more. It claims to be an incredible system that can help you make an insane amount of money online, and live the luxurious life that everyone dreams of. Apparently it was created by a man named Michael Sachs, and it has already helped tons of people make insane amounts of money online. What Is Million Dollar Replicator Really? Despite the fact that the sales video claims that it’s not some hyped up system that won’t actually live up to the claims it makes. That’s exactly what it is. While doing research for this system I found out the the sales page is full of misinformation, exaggerations, and even straight up lies. Throughout the rest of the review I’ll going over the many problems that I found with Million Dollar Replicator. Let’s go over some of both the good and bad things I could find out about this system. Over the next few sections I’ll be going further into detail about what I actually mean with all of the points listed above. I know that idea that you could be making hundreds of thousands or even millions of dollars with a month or so of joining sounds great. However that is simply just not realistic at all. While it is certainly possible to make really good money online (I make a living online) it is not something that’s going to happen overnight. They try to make it seem like you just copy and paste their system, then bam you’ll start making thousands. That’s not how making money online works. Sure it’s possible (unlikely) that you’ll be able to make some money with this system, however it’s not going to be anywhere near the amount they claim. Not even the people who claim to be making millions in the sales video make that much! This is a common tactic that I see when it comes to new “make money online” products. They pay some actors to claim that the system has made them insane amount of money basically overnight. As soon as I saw the testimonials I knew they were fake because I’ve seen the same actors in other scams like Real Profits Online, and Ecom Cash Code! Don’t worry, you don’t have to take my word for it, because I have proof. 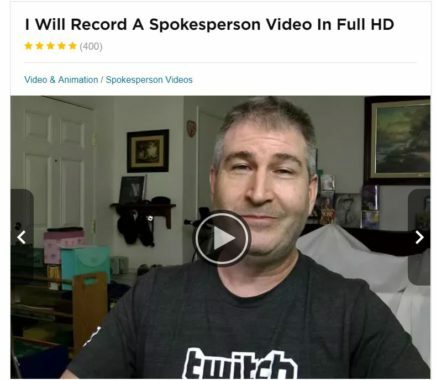 The above images show the person in the sales video claiming to make over $800,000, and the one below it shows him advertising his services as a paid spokesperson. If you’re surprised about the fact that the testimonials are fake, then you’ll really be surprised to learn that the creator in the video isn’t actually the creator. Whenever I come across a new product I like to do research about the creator and find out if they’ve made any other products in the past. Well I couldn’t find anything about this “Michael Sachs” guy, so I decided to do a reverse Google image search on his picture to see if I could find anything. 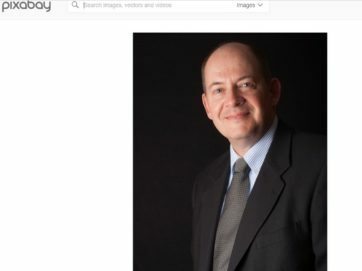 Well I found something that was certainly interesting, the pictures of him were just pulled from a random stock photo website. On the sales page they have an image that insinuates that this system has been featured on or promoted by various well known outlets. I just took an extra minute to try to find out what those outlets had to say about it, and I couldn’t find anything. If this system really was featured on Forbes, CNN or Huff Post you’d be able to do a quick search and find the articles. However not a single thing popped up when I did. I want to be completely honest in this review and let you know that I didn’t actually purchase Million Dollar Replicator because of all of the points I listed out above. With that being said, it’s possible that it could teach you a method that will make you some extra cash online. I strongly doubt it, but it’s possible. The problem is that they simply don’t give me enough information in the sales video or page to determine whether it could work or not. They don’t say what you’ll be doing, how you’ll be making money, how much training you’ll get, what tools you’ll get or any of the information I need to determine that. I’ve written hundreds of review for both scams and legitimate systems, and all of the good ones give you all of the information up front before you have to get out your wallet. 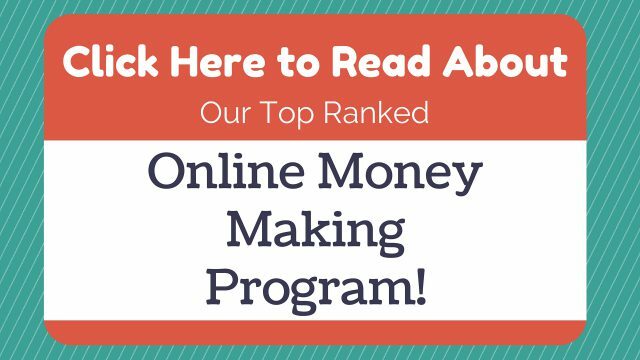 Heck, My Top Ranked Program let’s you try out everything that they offer for completely free! 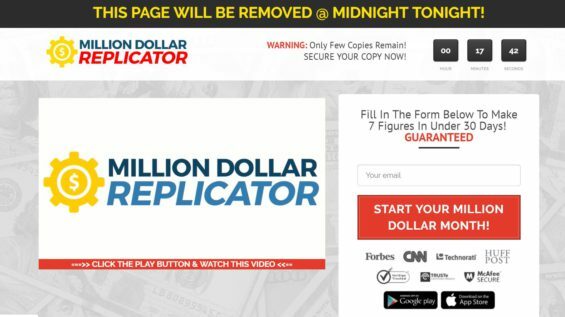 Is Million Dollar Replicator A Scam? At the end of the day it is up to you to decide for yourself whether or not you want to consider it a scam. The sales page is full of lies and misleading information, a lot of which I didn’t even go over in this review. With that being said, you can get a refund through ClickBank if you purchase it and decide you don’t like it. Personally I think Million Dollar Replicator is a get-rich-quick scheme that you should completely avoid! If you’re interested in making money online, and you’re actually willing to put in the time and effort it takes, I have a suggestion for you! One thing you need to know is that it’s not a get-rich-quick scheme, it’s a training program! You have to actually dedicate a good amount of time and effort into it if you want to get anything out of it. Is Million Dollar Replicator A Scam? What Do You Think? Let Me Know In The Comments Below!